Real Madrid captain Sergio Ramos and goalkeeper Thibaut Courtois each praised the use of VAR in their controversial 2-1 win over Ajax on Wednesday. 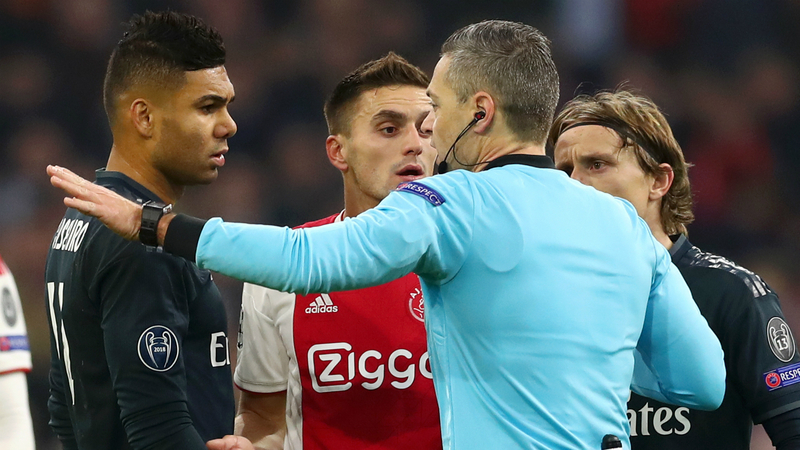 The hosts were the stronger side in the first half of the Champions League last-16 first leg at Johan Cruijff ArenA and thought they had gone ahead when Nicolas Tagliafico headed in a rebound after a Courtois error. However, VAR was used to overturn a goal decision for the first time in the competition's history after referee Damir Skomina checked the touchline television monitor. UEFA later tweeted to confirm the goal was ruled out because Dusan Tadic was in an offside position and impeding Courtois when Tagliafico scored. Ramos welcomed VAR's intervention, telling Movistar: "I'm an advocate of VAR. Little by little, football will be more fair. Sometimes it has been harmful to us, and today it ruled out an important goal." preventing him from playing or being able to play the ball – as the header was being made. This was in line with VAR protocol and the goal was correctly overturned and a free-kick given for offside. When asked if the decision was correct, Courtois said: "I think so. When it happened, I thought it could be offside. When the guy headed it, I wanted to go and catch it. "Because of his [Tadic's] intention, I made a quick movement. It's lucky there was VAR because nobody would have seen it." Madrid went ahead through Karim Benzema and, although Hakim Ziyech equalised, they secured a first-leg advantage through Marco Asensio's close-range finish in the 87th minute. Ramos was impressed by Ajax's high-pressing approach and revealed Madrid switched their tactics in the second half to gain a foothold in the match. "Amazing atmosphere. I congratulate the fans and this team, who play very good football and with a lot of personality," he said. "We were together, and we took advantage of the counter-attacks. We got two away goals. You have to know how to read games and we did that. "They pressed very high and did not give you time to receive the ball from the back. We changed to look for balls into space and to break the lines." Ramos was also proud to play in his 600th match in all competitions for Madrid, adding: "It's not easy to reach 600 games for my club. I hope there will be many more and every day I get up excited to represent the team as captain."